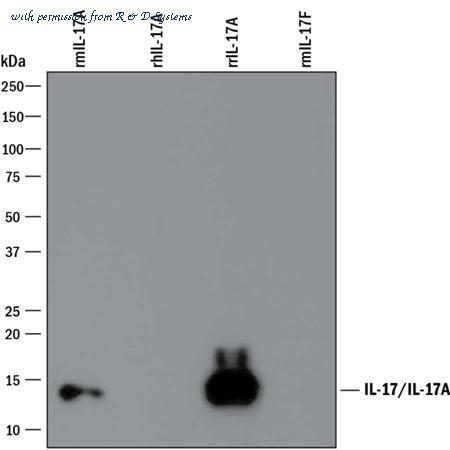 Detection of Recombinant Mouse IL-17/IL-17A by Western Blot. Western blot shows 25 ng of Recombinant Mouse IL-17/ IL-17A (Catalog # 421-ML ), Recombinant Human IL-17/IL-17A (Catalog # 317-ILB ), Recombinant Rat IL-17/IL-17A (Catalog # 8410-IL ), and Recombinant Mouse IL-17F (Catalog # 2057-IL ). 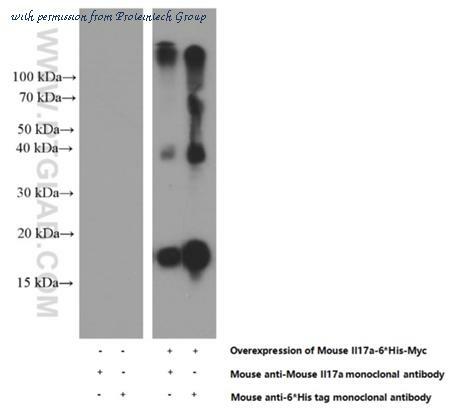 PVDF Membrane was probed with 1 ╡g/mL of Rat Anti-Mouse IL-17/ IL-17A Monoclonal Antibody (Catalog # MAB421) followed by HRP-conjugated Anti-Mouse IgG Secondary Antibody (Catalog # HAF007 ). 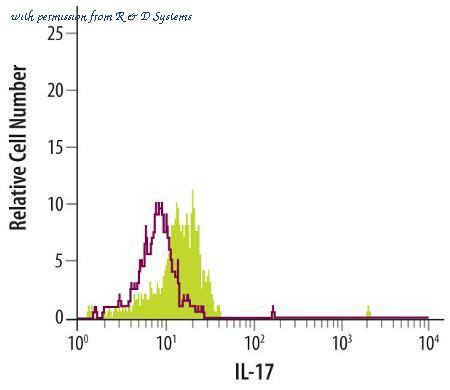 A specific band was detected for IL-17/IL-17A at approximately 15 kDa (as indicated). This experiment was conducted under reducing conditions and using Immunoblot Buffer Group 3 . 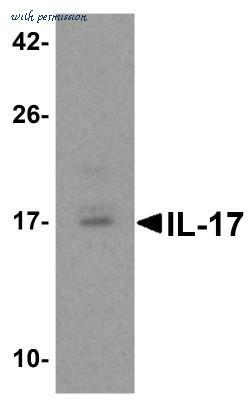 Detection of Recombinant Mouse and Rat IL-17/IL-17A by Western Blot. Western blot shows 25 ng of Recombinant Mouse IL-17/IL-17A (Catalog # 421-ML ), Recombinant Human IL-17/IL-17A (Catalog # 317-ILB ), Recombinant Rat IL-17/IL-17A (Catalog # 8410-IL ), and Recombinant Mouse IL-17F (Catalog # 2057-IL ). PVDF Membrane was probed with 1 ╡g/mL of Rat Anti-Mouse IL-17/IL-17A Monoclonal Antibody (Catalog # MAB721) followed by HRP-conjugated Anti-Rat IgG Secondary Antibody (Catalog # HAF005 ). 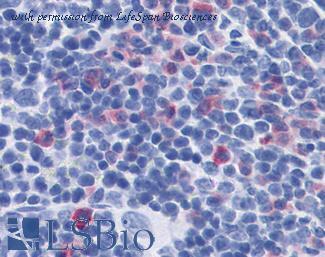 A specific band was detected for IL-17/IL-17A at approximately 14 kDa (as indicated). This experiment was conducted under reducing conditions and using Immunoblot Buffer Group 3 . Detection of IL-17 in EL-4 Mouse Cell Line by Flow Cytometry. 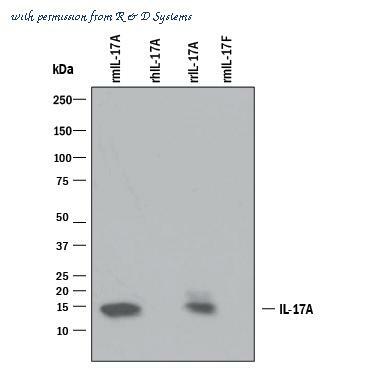 EL-4 mouse lymphoblast cell line was treated for 16 hours with 50 ng/mL PMA then stained with Goat Anti-Mouse IL-17 Antigen Affinity-purified Polyclonal Antibody (Catalog # AF-421-NA, filled histogram) or isotype control antibody (Catalog # AB-108-C, open histogram), followed by Phycoerythrin-conjugated Anti-Goat IgG Secondary Antibody (Catalog # F0107 ). To facilitate intracellular staining, cells were fixed with paraformaldehyde and permeabilized with saponin. 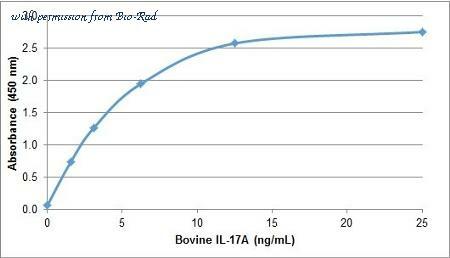 Western blot using Rockland's anti-IL-17A antibody shows detection of rat recombinant IL-17A protein (lane 1). Approximately 2 µg of recombinant protein was loaded onto the gel. Primary antibody was used at a 1:1,000 dilution. The membrane was washed and reacted with a 1:20,000 dilution of DyLight™ 649 conjugated Gt-a-Rabbit IgG (p/n 611-143-122). Molecular weight estimation was made by comparison to prestained MW markers indicated at the left. Other detection systems will yield similar results. 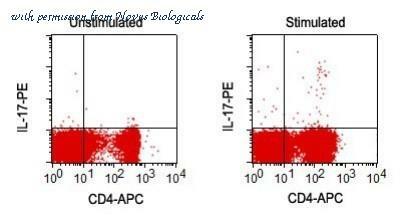 Rockland monoclonal anti IL17A was used to detect IL-17A and separate Mouse CD4+ Cells by flow cytometry. Mouse CD4+ T cells were isolated from freshly dissected spleen by centrifugation in T cell separation media and selected by magnetic separation. Cells were grown on plates coated with anti-CD3 antibody, and stimulated with: 5 µg/mL anti-CD28, 10 ng/mL IL-1beta, 50 ng/mL mouse IL-6, 1 ng/mL TGFbeta1 and 10 µg/mL anti-mouse IFN? over 8-10 days of culture. 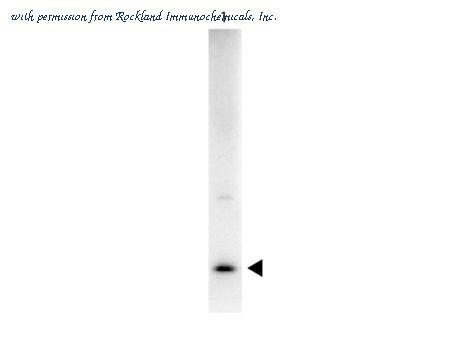 Cells were incubated for 15-20 minutes with Add rat anti-mouse CD4 APC at a concentration of 0.125 µg/mL, washed, fixed and permeabilized and incubated with Rockland Rat anti mouse IL-17A monoclonal Antibody (210-501-B32) or controls as shown. Cells were washed, incubated in streptavidin conjugated PE, fixed and analyzed by Flow cytometry. Shown here are results for positive and negative controls. Western Blot showing detection of Rat IL-17A. 50ng of Rat IL-17A (Lane 1) was run on a 4-20% gel and transferred to 0.45 µm nitrocellulose. 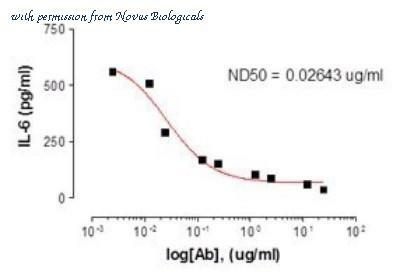 After blocking with 5% Blotto (p/n B501-0500) 30 min at 20°C, Anti-Rat IL-17A (RABBIT) Antibody Biotin Conjugated (p/n 212-406-B32) secondary antibody was used at 1:5000 in Blocking Buffer for Fluorescent Western Blotting (p/n MB-070). HRP Streptavidin (p/n S000-03) was used at 1:40,000 in MB-070 for 30 min at 20°C and imaged using the Bio-Rad VersaDoc® 4000 MP. 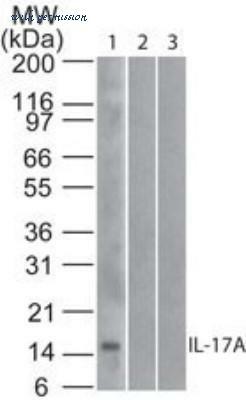 Arrow indicates correct 15 kDa molecular weight position expected for Rat IL-17A. 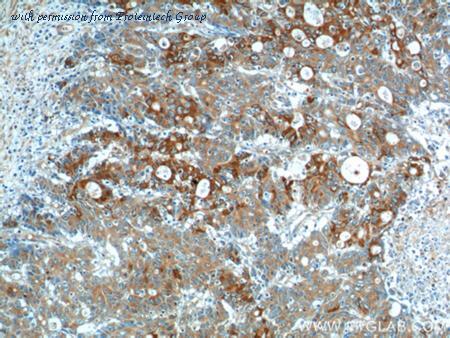 Anti-IL-17 antibody IHC of mouse spleen. Immunohistochemistry of formalin-fixed, paraffin-embedded tissue after heat-induced antigen retrieval. Antibody concentration 10 ug/ml.